Cellecta CloneTracker XP-rLuc libraries have the same design as the other CloneTracker XP™ libraries, with a barcode inserted in the 3′-UTR of the reporter transcript so it is detectable by RNA sequencing. Rather than a fluorescent protein marker, CloneTracker XP-rLuc libraries have a red-shifted luciferase (rLuc) derived from Photinus pyralis (Ppy RE9 mutant) as a reporter for bioluminescent imaging (BLI). Luciferase reporters provide a useful tool for indirect cell labeling and tracking of cell fates in vivo. 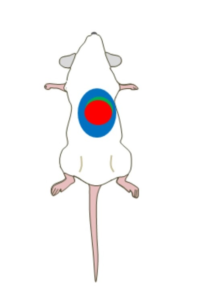 While the BLI technique has been successfully used for monitoring of migration, growth, and viability associated with drug treatment of transplanted cancer, stem, or immune cells in mouse models, standard luciferase assays in animal models are particularly sensitive because they are not subject to high background as a result of tissue autofluorescence. The codon-optimized Photinus pyralis far-red luciferase in the XP-rLuc Liibrary offers enhanced sensitivity and resolution in deep tissue– 50- to 100-fold better light intensity than the click beetle (Renilla) enzyme. The CloneTracker XP-rLuc Library can be transduced into cells to create a barcoded cell population, which, when engrafted into mice, can be used for monitoring tumor formation and metastasis growth. BLI of rLuc-tagged cells in vivo requires the use of an appropriate imager for detecting photos generated from D-Luciferin substrate by CCD cameras able to sample the entire visible and near-infrared spectrum. For details on in vivo imaging, please refer to the standard protocols provided with your instrument, for example, In vivo Bioluminescence Imaging of Luciferase-labeled Cancer Cells protocol for BLI using the IVIS Spectrum Imager from Perkin Elmer. Cellecta also provides Custom Barcode Libraries if one of our off-the-shelf designs does not meet your needs. Contact us for more detailed information or to ask for a quote. CloneTracker XP Barcode Libraries are provided with a complete protocol and all sequencing information to enable researchers to perform experiments and extract the data. However, we also provide Next-Gen Sequencing and analysis services for researchers running their own screens with our libraries. Just provide harvested cells or tissue for each time point or treatment condition (one sample), and we’ll extract DNA, amplify the barcodes, sequence, and assemble the data with some basic analysis. Optionally, we’ll also extract RNA and perform RNA-Seq. Please see the Next-Gen Sequencing and Analysis web page for additional information and instructions on how to order.